2009 October — Dayna Macy, author of "Ravenous"
That’s what the fine publisher of the Yoga Journal Russian edition wrote on the birthday card she sent me, along with a beautiful bouquet of flowers. For several years, I’ve had this dream about returning to the East Coast (where I’m from), and renting a cabin for a month in the Fall. I want to write while watching the trees turn brilliant shades of gold and red. Next week I’ll live a more modest version of that dream. I rented an apartment in Nyack, overlooking the Hudson River. 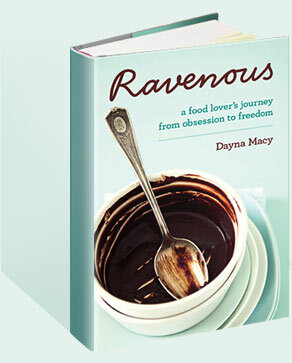 While there, I will be interviewing some folks for “Ravenous,” my book, including the fine folks at Camp Hill Farm, and the writer Joan Gussow. I will also be catching up with my friends Lisa and Denise, who own a groovy store in Nyack called Sign of the Times. Can you go home again? That’s something I explore in my book, and something I will know more about in a week when I return. David Letterman’s on-air discussion of his affairs with staffers and the subsequent extortion plot was the weirdest thing I’ve seen in a long time. He just couldn’t make the grown-up leap to apologize to all those for whom his actions might have caused harm. He didn’t need to crucify himself, but what happened just isn’t funny and trying to make it humorous was just awkward and bizarre.